Shawn Michaels was sitting on top of the world with his Intercontinental Championship firmly around his waist in May 1993. Little did the cocky competitor know that he would soon be knocked off his perch by an individual who came to New York City’s Manhattan Center in disguise. That night, Michaels boasted that he would defend the Intercontinental Title against anybody. A mystery man then came into the ring dressed in a hooded shirt and sunglasses and revealed himself to be HBK’s former friend and tag partner, Marty Jannetty. Michaels had to put his money where his mouth was and give the former Rocker the title opportunity. Their match was arguably the most competitive contest held thus far in the four months that Raw was on the air. It was getting hot under the collar for HBK, who grabbed his championship and attempted to leave the arena, but was prevented from doing so by Mr. Perfect. 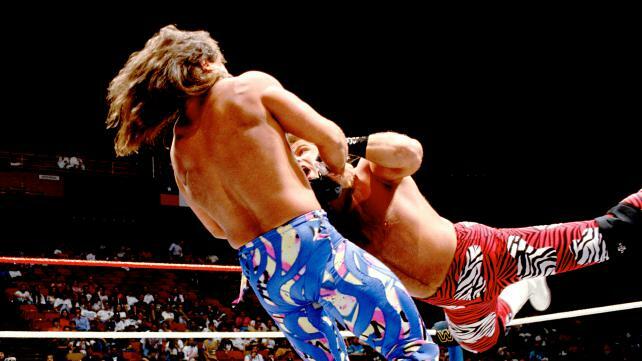 That allowed Jannetty to take advantage of things, and in the process, roll up HBK to win his first and only singles championship in WWE.